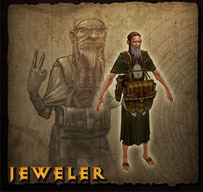 The Jeweler, Covetous Shen, is one of the three Artisans introduced in Diablo III. Like the Blacksmith and the Mystic, the Jeweler is located in the Caravan area. He handles item socketing and unsocketing, and upgrades gems. All of the Artisans are involved in quests and the game's plot, even after the player completes the initial quests to get them to join up with his adventuring efforts. See all of the crafting Jeweler Designs. Jeweler concept and in-game version. The jeweler crafts gems, amulets, and rings. The jeweler can also remove gems from socketed items and can combine gems to improve their quality. He no longer has any crafting recipes to make rings or amulets (the Blacksmith now handles all item crafting/creation), and as of the beta build the Jeweler's functions are limited to upgrading gems, adding sockets to items (formerly a talent of the Blacksmith), and removing items from sockets. 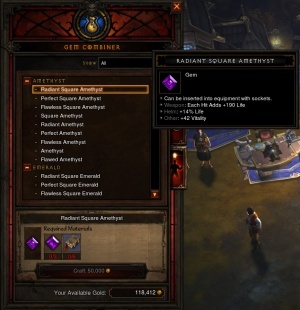 Sockets can be added to numerous types of items in Diablo III. These include: all types of Weapons, Shields, Helms, Bracers, Belts and Boots. Full details of socketing aren't yet known; for instance might higher training levels allow a greater number of sockets to be placed in an item? One service that's definitely provided by the Jeweler is the upgrading of gems. Gems from levels 1-5 can be found in the game; to get to the higher levels 3 gems of one level must be combined to make the next. This recipe is subject to change if the team finds it takes too long to make the higher level gems; at the 3:1 ratio it will take 19,683 Perfect (L5) gems to upgrade to 1 Radiant Star (L14) gem. If the ratio was lowered to 2:1, then it would only require 512 L5 gems to make a L14 gem. All runes required 3:1 ratios for upgrading in Diablo II, until that was lowered to 2:1 for the higher level runes. A similar modification might take place with Diablo III's gems. 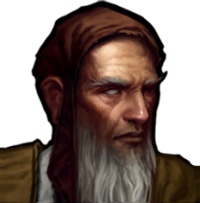 While we do not yet know the Jeweler's full character bio, he's found in Act Two, Quest 7, Blood and Sand. The hero rescues him from the lair of an especially murderous SuperUnique monster. Of the Jeweler's character, we know that he's a greedy old man who latches onto the hero more out of a desire for personal riches than to help save the world. The Jeweler is a bit of a greedy sort, and the player character encounters him during his search for a particularly rare gem. The player has to kill a nasty demon to help the Jeweler get the jewel, and by this the Jeweler sees that tagging along could be fairly profitable. The Jeweler sounds Chinese in the bits of dialogue so far revealed via data-mining. Concept art for the Jeweler's wagon. 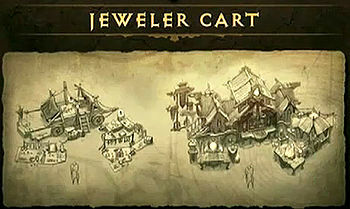 The design of the Jeweler's wagon was discussed during the Crafting Sanctuary panel at Blizzcon 2010. There the team related their issues in designing the Jeweler's wagon and making clear the upgrades it received over time. It was difficult partially because his items are so small. With the Mystic and the Blacksmith the items lying around on display could be used to show the increasing level of their craftsmen. Bigger swords and axes for the Blacksmith, glowing or flaming wands or crystal balls for the Mystic. But since the Jeweler works with tiny gems and amulets and rings, that wasn't as easy an option. The developers opted to show his higher level largely through his wagon, by making it get much larger over time, with more intricate details, gold-plating on the sides, etc. As the Jay Wilson said, "Everyone levels up in Diablo. Even the vendors." The Jeweler is in some way involved in the following achievement(s). See the Jeweler in the Image Gallery. 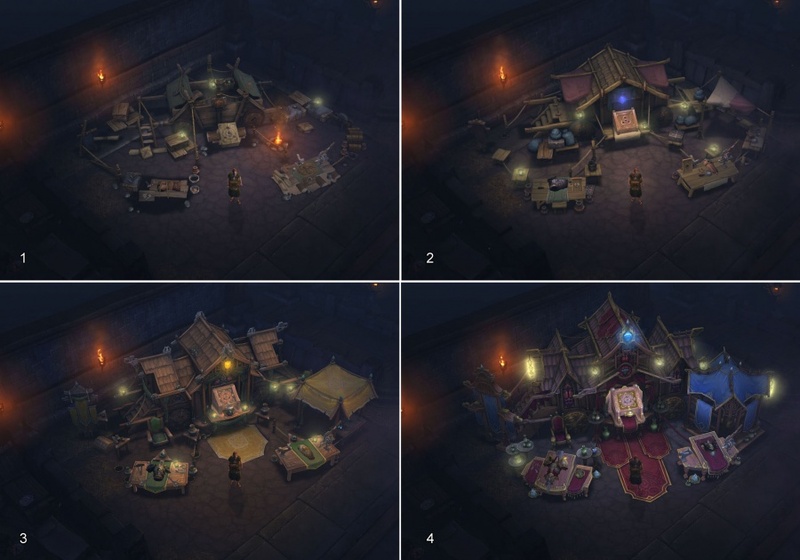 Four upgrades (not the first four, but which exactly is unknown) of the 10 potential looks for the Jeweler's wagon. December 2011. This page was last edited on 29 November 2013, at 03:24.